Last week, I shared my amazing finds from a recent trip to Ikea. One of the (many) items I couldn't resist was a colorful spring tablecloth (at a steal- $15!) from their kitchen + dining section. Since I've already spruced up my dining room table with my DIY potted clothespin planters, I thought it'd be fun to wave a magical spring wand across our kitchen breakfast table this time around. 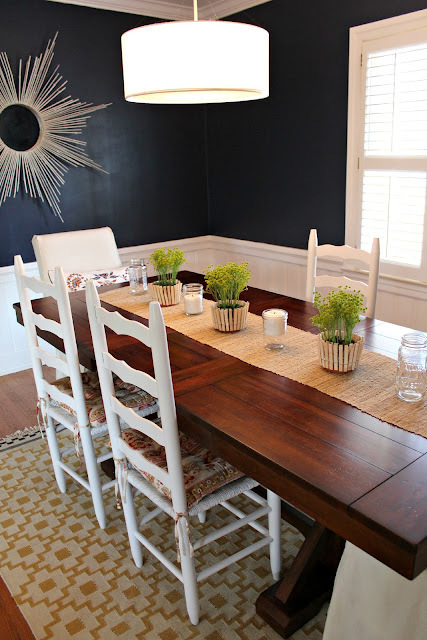 I usually prefer not to cover up our rustic table (which only has two chairs... 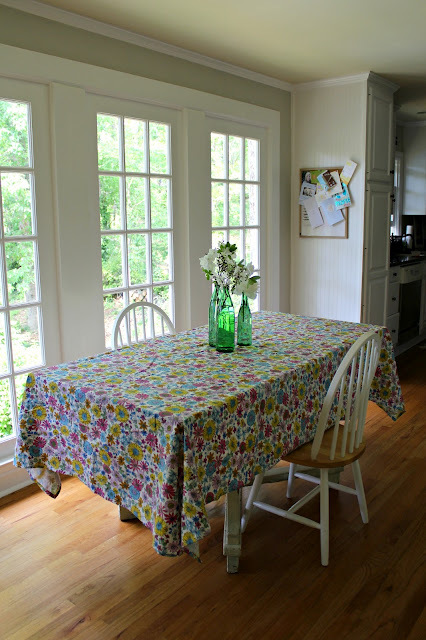 I know, I've fallen slightly short of my goal to "collect" white chairs to put around the table), but I thought it was high time I make an exception for this fun spring tablecloth. I usually opt for runners instead of tablecloths, but I thought this little guy could be perfect later in the season for outdoor entertaining or maybe even picnics in the park?! I simply grabbed three old recycled glass bottles and filled them with some spring clippings from our yard. 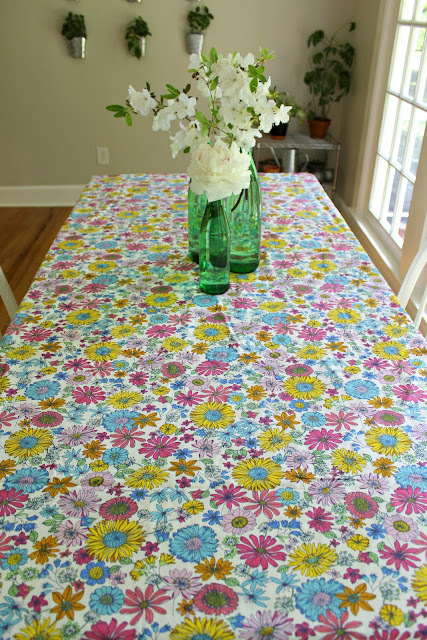 I chose all white so the flower colors didn't compete with the bright patterned tablecloth. 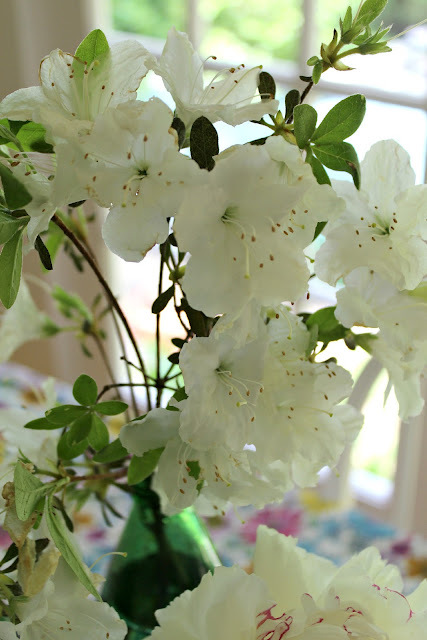 I love our azaleas and peonies! That's my first peony bloom of the year, by the way. It smells delish. I'm loving the unexpected pop of color every time I walk into the room! For those of you who like the big picture view... here's our little spring-ed out breakfast nook. I love how you can see our DIY garden wall in the background. All that foliage ties in nicely! So there you have it. A cheap and easy spring table for $15. Have you spring-ed out your house yet this season? 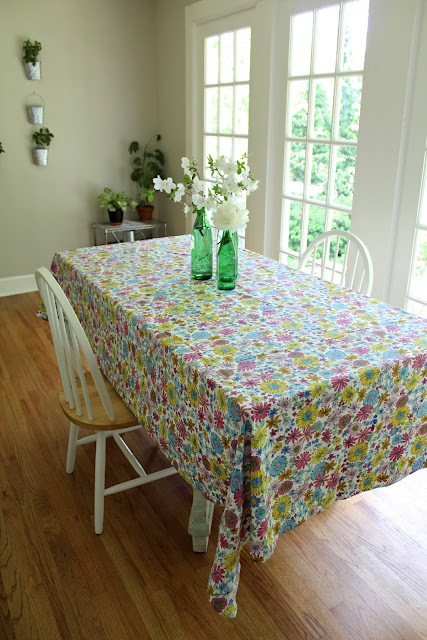 What a pretty tablecloth. Wish I had such great blooms to clip in my back yard - gotta work on that this summer. I love those white blooms! Your table looks amazing! My peonies are nowhere near blooming yet, so I am drooling over yours! 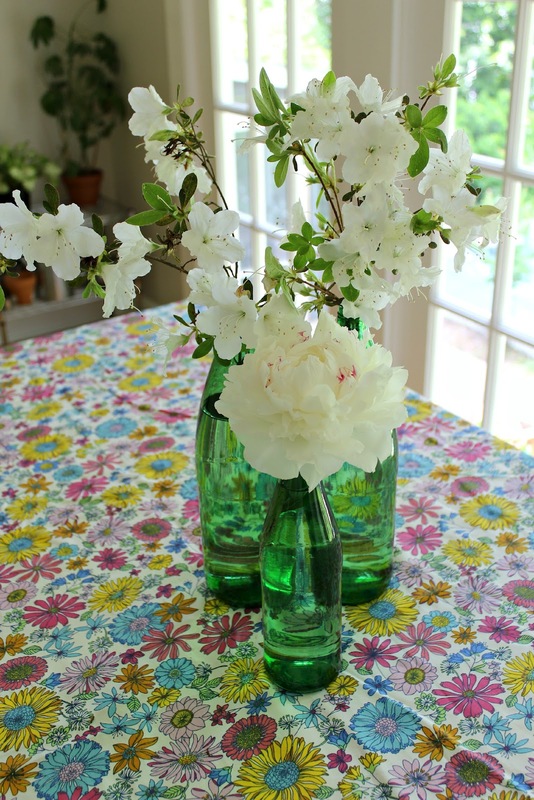 I love using random glass bottles for vases. You are so creative! Love this! I love pops of color and green - perfect for spring. And I can't wait to get some peonies! Gorgeous flowers! Love how simple and chic this is! Oh, it looks so bright and fun. We went to Ikea twice this weekend! Hadn't been in forever and did some serious damage. I am so in love with their high gloss expedits. Have you seen???? Looks beautiful! 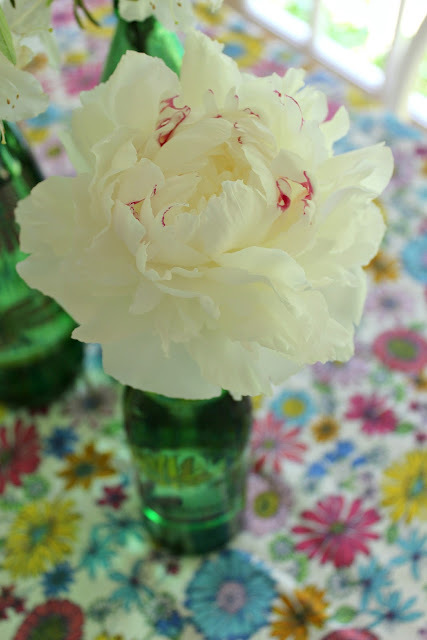 I love a peony, they are one of my faves! Your tables are so gorgeous! 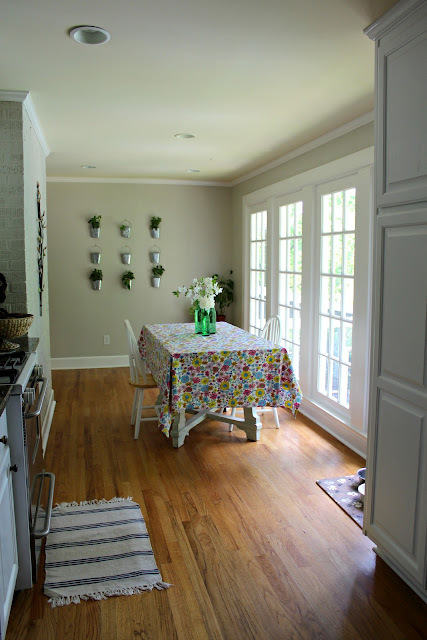 I really love the dining room! It's so fun! Love your peony bloom too! 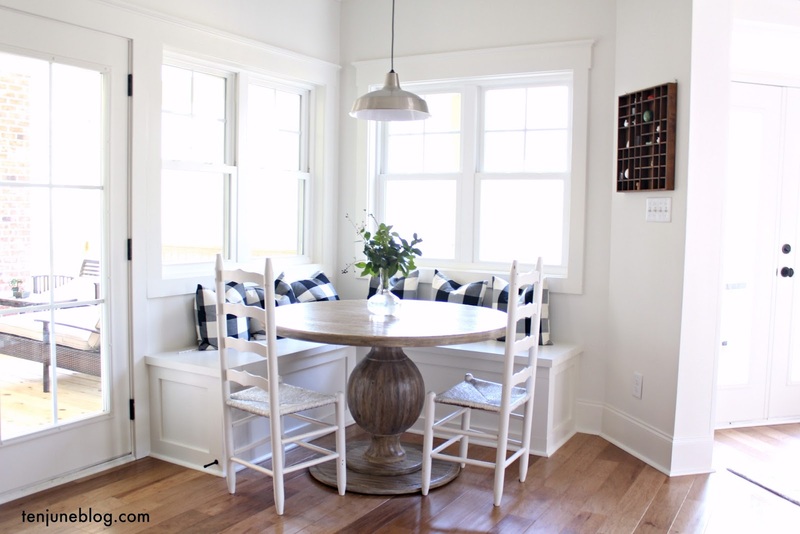 I love the runner on your dining room table, and have been looking for one similar. Where did you find this one? I have a trio of bottles sitting on my dining table too. =) Only I used a placemat inside of a table cloth.